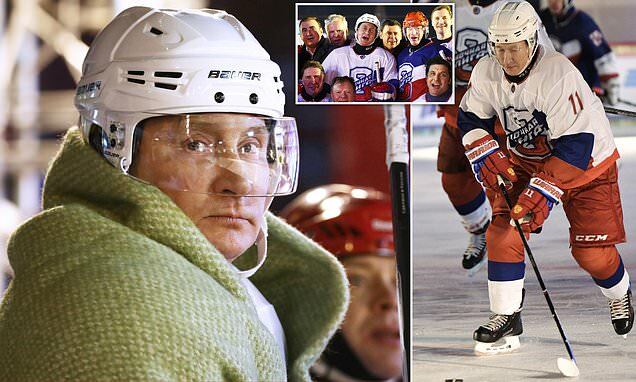 Russian leader Vladimir Putin put on his ice hockey gear and took to the rink in Moscow on Saturday in a festive game with politicians and sports stars. The country's President, 66, put on a helmet, shoulder pads and skates and brandished a hockey stick for a friendly game in Red Square. Putin took practice shots and jostled for possession with Russia's defence minister and former stars of the NHL in North America. Politicians and hockey stars mingled at an outdoor rink with a view of the Kremlin behind it, in Putin's latest camera-friendly PR stunt. The regular festive game comes a week before Russia celebrates Orthodox Christmas on January 7. With temperatures below freezing in Moscow Putin was seen wrapping up in a green blanket before the game got underway.